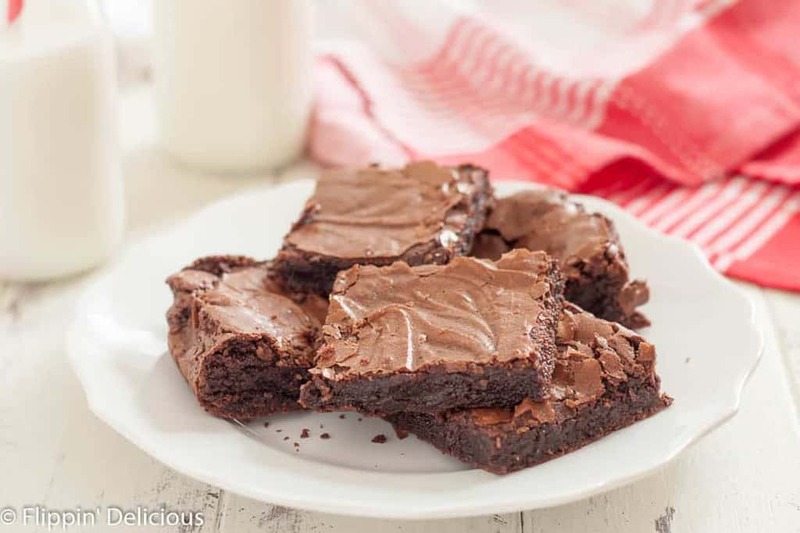 The best gluten free fudgy brownie recipe I have ever made! Rich and fudgy made with cocoa powder, they have the perfect flaky top. Ashton at Something Swanky is one of my favorite bloggers. 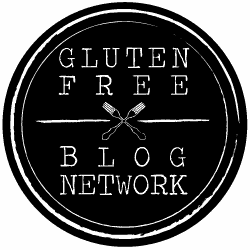 No, her blog isn’t gluten-free but just go and look at her pictures. They make my mouth water! 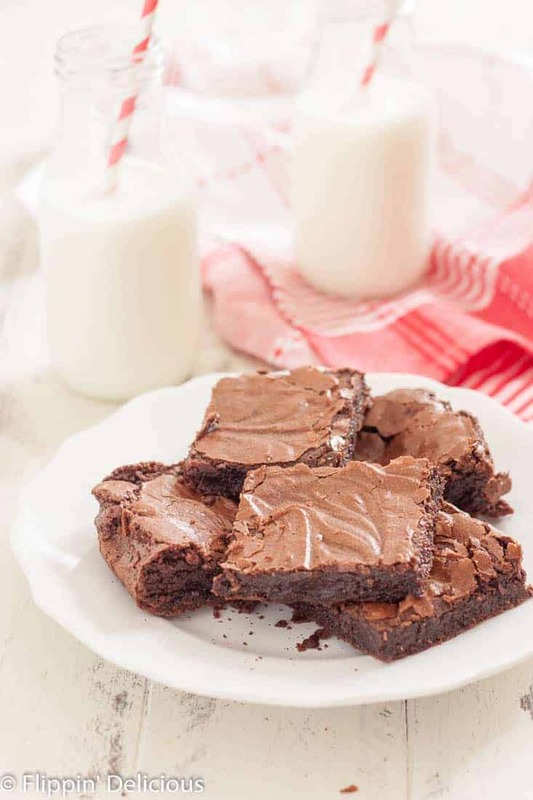 A few months ago Ashton posted a recipe for these amazing Browned Butter Brownies. I made a few changes to the recipe that Ashton shared and this was my result. I had been searching high and low for a gluten free brownie that my husband likes. I hadn’t successfully made a gluten-free brownie that tasted just like the gluten-filled ones I used to make with a boxed mix. I have made them several times, with browned butter and without. 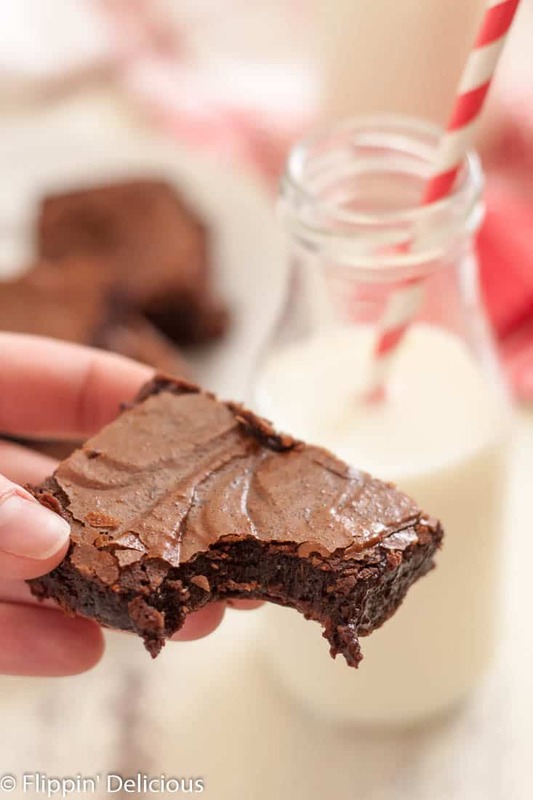 I loved the subtle nuttiness that the browned butter adds but my husband preferred these brownies without the browned butter because it tastes more traditional. If you have to eat dairy free you can easily use vegan butter or even your cooking oil of choice. That is what we do since we are a dairy free household right now. Since baking this gluten free fudgy brownie recipe I have used it in my gluten free cookie dough brownies, no churn cream cheese brownie ice cream, no churn gluten free cookie dough brownie ice cream, gluten free caramel stuffed brownies, and I adapted it for fall inspired dairy free gluten free pumpkin swirl brownies. This recipe is super versatile and is always a hit. 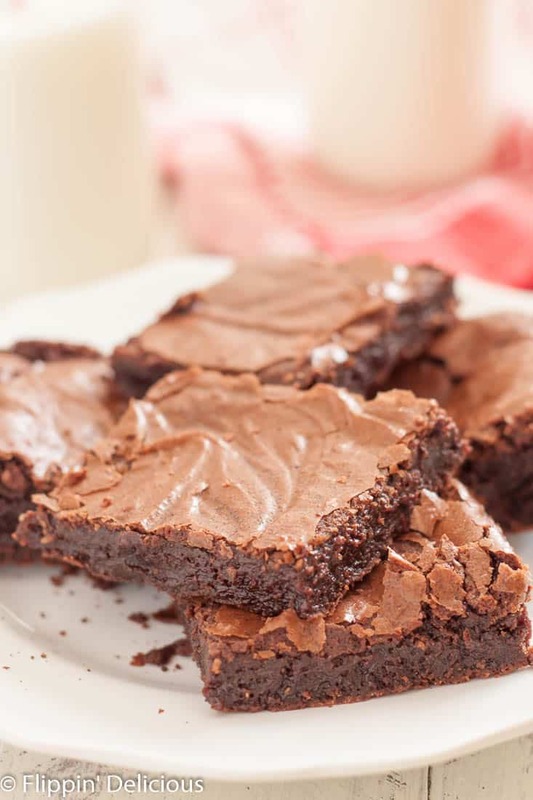 Just look at how fudgy these brownies are! 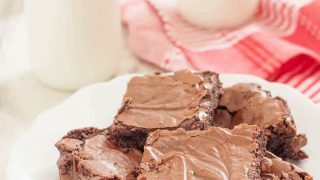 If fudgy brownies aren’t your thing, you’ll have to check out my gluten free dairy chocolate chewy brownies. Next on my list to conquer….the perfect gluten free cakey brownie! 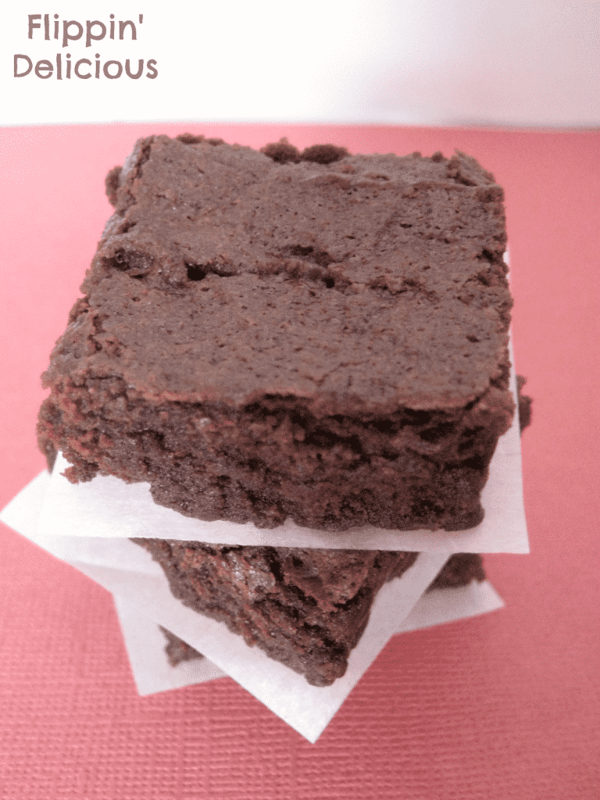 Fudgy gluten free brownies recipe made with cocoa powder with a dairy free option. Add the salt and vanilla. Add the eggs, one at a time, mixing in between each addition. Add the gluten free flour blend and mix well. The batter will be thick. Use a sturdy spatula to spread batter in the prepared 8x8 pan. Bake for 30-35 minutes until toothpick inserted comes out with a few crumbs and no wet batter. Let cool, then cut into 2" squares. Try really hard to not eat them all yourself. « Asian Peanut Butter Chicken Lettuce Cups AND Pacific Beach Peanut Butter Review! These are so yummy! Only gluten free brownies I’ve made that have turned out! I love them! Thank you! You are very welcome! I’m so happy that your family enjoyed them. These were a Valentine’s hit with my husband! So we aren’t gluten free….would whole wheat flour work ok? Hi Mandy! Flours are very different so they may turn out a little bit different but I think that with this recipe you should be able to switch to wheat flour without too many problems. That is NOT the case with most recipes. I actually adapted this recipe from a recipe that uses regular flour. https://www.somethingswanky.com/browned-butter-brownies/ A clickable link is just above my recipe too. Did you use the xantham gum in these? They look great! In this recipe I didn’t use xanthan gum because there was such a small amount of flour in the recipe, in relation to the eggs and other ingredients that I didn’t think it needed the extra structure. If you’d like to add some xanthan gum, for that extra structure, I’d suggest an 1/8 tsp, or maybe 1/4 tsp but not more than that. Awesome Brownies! My dad has celiac and I am always looking for good recipes. My mom treats him so well and cooks yummy gluten free things for him. I am always trying to trump her. And this did it! She asked me for the recipe. I got major “brownie” points. Thanks Brianna. I’m so happy that they turned out! The substitutions are great to know. I can’t wait to hear what other recipes you try! I’m glad that you enjoyed the recipe Katie! I LOVE it when people like you let me know that you tried my recipe, it makes my day! Gluten-free baking isn’t as big and scary as it is sometimes made out to be. Happy Baking! I am trying to get the rice flour blend and the link I click is not there anymore. When I moved my blog to wordpress some of the links got scrambled. 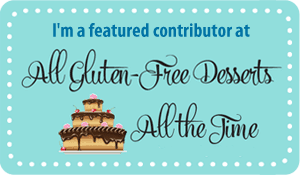 You can also just click “My Gluten-Free Flour Blends” in the navagation bar at the top of the page. Could you use Bob’s Red Mill Gluten Free All Purpose Baking Flour instead of the rice flour blend? You can try using Bob’s Red Mill AP Flour, but I prefer to not use it in my recipes because I’ve found it is too heavy and often tastes beany if it isn’t lightened up with some other flour. It will probably work just fine, but the result may be slightly different. I made these last night for Thanksgiving dessert! I pressed bits of walnuts in before baking, and they were sooo delicious! Just as good as ones with gluten. Thanks Shira, the walnuts sound like a tasty addition! can you substitute almond or coconut flour in stead of rice flour. I have just about every flour,but rice. Almond flour and coconut flour work very differently and can not be straight across substituted in this recipe. In fact I don’t use straight rice flour either, but I use a combination of flours. If you try substituting almond or coconut flour I think you’d have very, very different results. You can however try using a different rice flour-based all purpose blend. Mine is just my favorite. Can’t you just make your own rice flour in a coffee blender? I wouldn’t try it. Whatever flour you ended up would be gritty and sandy, and would make anything you used it for the same. I recommend buying rice flour. It is readily available online, I often order from nuts.com or amazon.com. You can probably also find it at a health-food store locally. Also, be sure to not use straight rice flour in any of my recipes. I NEVER use straight rice flour. I use a blend of different flours that you can find HERE. I normally link to it on the recipe page also. My flour blend has no xanthan gum in it. I put the xanthan gum as a separate ingredient in my recipes, because some recipes need more, and some less. That way everything has the right texture and doesn’t turn out gummy. You can find my flour blend here: I’ll check that link to see why it wasn’t working. Happy Baking! Ok, So I Seriously LOVE these! I’ve made them a bunch of times. THE BEST!!! I followed ur recipe except I used 1 cup xylitol instead of sugar and coconut oil instead of butter. My brownies ended up being more cake like instead of fudgy. They were still good though.